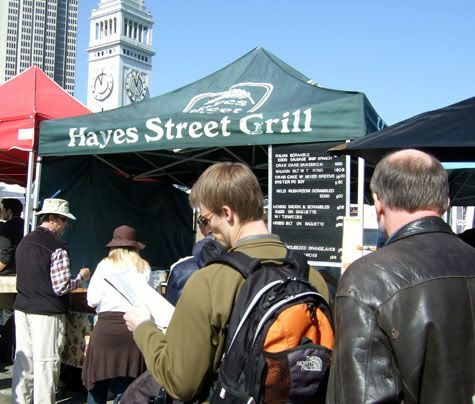 Mr. K and I are devoted fans of the delicious breakfast that is served by the Hayes Street Grill booth at the Ferry Building Farmer’s Market on Saturday. The booth is open (8-1:30ish) and is located on the south end of the area behind Sur La Table, tucked in the row of food booths (Vicolo Pizza, Hog Island Oysters, Aidell’s Sausage and a Mexican Spot). The kitchen in the back of the booth looks pretty basic, but the food is always perfectly cooked and there is almost always a line of hungry shoppers patiently waiting for their bacon. The kitchen cranks out plate after plate of delicious food. I love to watch the chefs cook, they are very methodical and nonchalant about the never-ending line. 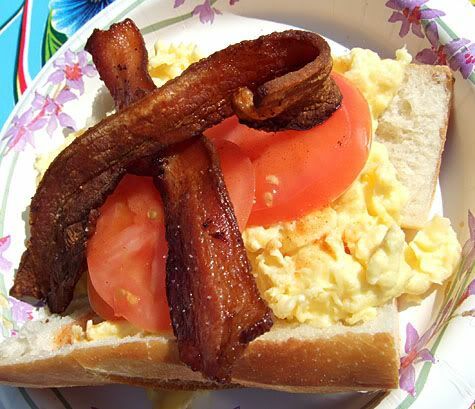 This is scrambled eggs with sliced tomato topped with crispy cooked bacon served on a baguette. 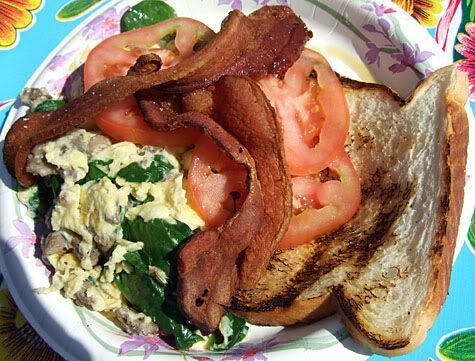 Mr. K’s favorite, the wild mushrooms with scrambled eggs, also served with slices of tomato and bacon on toast. I had a good recommendation to try the Panfried Hama Hama Oyster Po’boy, which was incredible. If you follow my foraging, you know that I am a big fan of oysters on the half shell, but there is something compelling about them fried… the texture of the oysters becomes fluffy, like a seafood souffle that has been breaded with cornmeal and fried crisp. 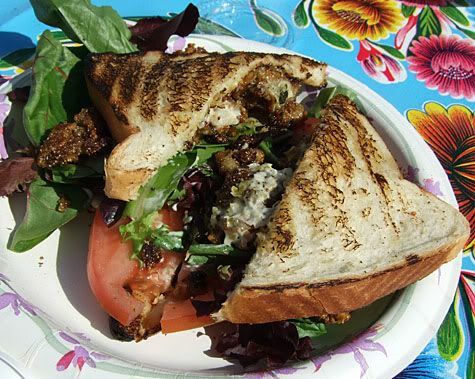 Mmmm, the oysters were slathered with mayonnaise and and layered with slices of tomato and lettuce, the holy trinity of sandwich making that is especially good when paired with fried foods. 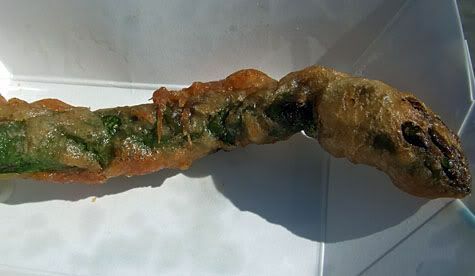 Here is a rogue item that MIL picked up, Asparagus Tempura. That was something that was best left unknown because now I’m going to be looking for that next time we’re here. Sounds like fun fun fun! Our market has one food stall, but it is not as gourmet as this. Very good, but this sounds amazing – and that Po’Boy, that could be DANGEROUS for me to be anywhere near! Wow your pictures are so good! Wow, that po’ boy looks amazing. I love fried oysters. Marvin, yep, it’s good fried food. 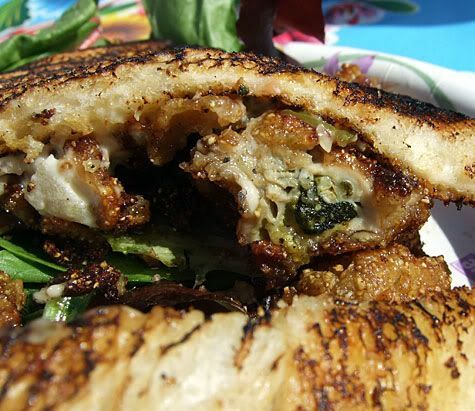 I can see from your post that SF folks aren’t missing out much in terms of good oyster po’ boys. I think I need to scratch my own po’ boy itch now. Lol. You and those lobster po’ boys. I think they’re just an excuse to keep you from freebasing the deep-fried lobster goodness. PE, You know I love anything battered and fried! But I definitely need to try an authentic one from your new hometown! CP, yeah it’s the fried part that gets me! Wow looks like an amazing array of food. 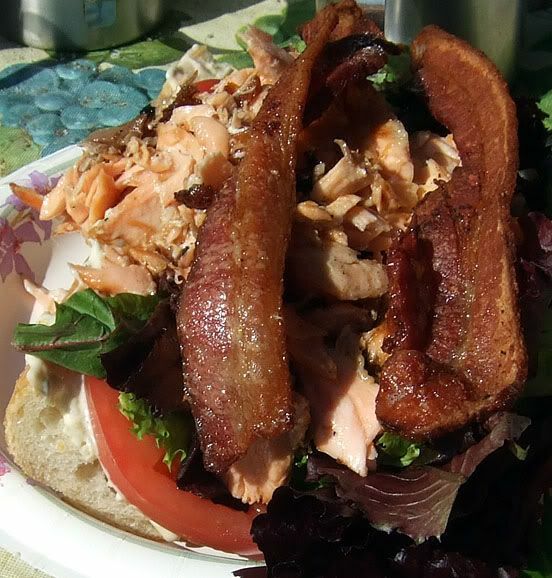 Yummmm… bacon.